Master Your Breath, Master Your Life. When we learn to master and apply healthy breathing techniques, we immediately begin to transform our life structures, beginning first with our health and well-being. The average adult is breathing 12,000 to 25,000 breaths per day and most of their breathing is habitually taking place high up in their chest. In effect, putting stress on the heart and the nervous system. Optimal breathing causes us to feel better by breathing better and then we start seeing the reflection of this optimal lifestyle in other areas: our relationships, our livelihood, our creativity and more. Synchronous Breathing is the divine technology that has been around for thousands of years that reminds us that we are all connected. Synchronous Breathing gives us the opportunity to experience Oneness through the power of simultaneous group breathing. Whether it is just two individuals or a large group consciously breathing together, we have the potential and the power to connect like we never have before and contribute more peace and happiness to the entire planet. Synchronous Breathing helps us dissolve any sense of separation in order to experience our unity and connection with all of life. So much love we get to share. “I’m a long-time meditator and what I experienced today was how breathing techniques definitely enhance my meditation on many levels both from a spiritual aspect and a therapeutic aspect. For the first time I felt the effects of conscious breathing and that was experiential. I recommend it because of the naturalness of it. The breath techniques were a deepening of the gift of life. The Breathing Techniques and Exercises Audio Tracks include 20 tracks for you to take along with you wherever you go. These tracks are an easy way to give yourself regular reminders to activate your Life Force practice. In this workbook you will find all of the conscious breathing exercises and experiences that we cover in the workshop video. Use the workbook for notes that will help you on the journey to discovering intimacy with your breathing. 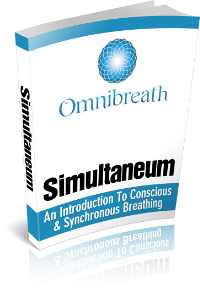 The Simultaneum eBook deeply focuses on why conscious breathing and breathing together are so important for individuals wanting to live at the peak of their evolution! Do As One is a 501(C)3 Non-Profit Organization. Tens of thousands of hours of experience and study with experts have been distilled to create these transformational tools. The Conscious Breath Experience has proven to enhance the quality of life for those who have embraced the practice. These simple and potent practices will lead to waves of positive improvements in practically every area of your life.